This is not your average milk and cereal bar! 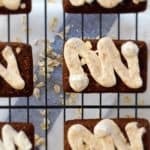 Nope, it's not only gluten free, egg free and soy free, but it's filled with whole grain goodness, baked with milk and topped with a hearty dose of nut butter and Greek yogurt! Pulse GF cereal, oats and baking soda in a food processor for 3-5 minutes until flour like consistency achieved. Remove and set aside. Add the dates and milk to the processor, fitted still with the metal blade. Pulse 5 minutes until a thin paste is achieved, add in butter, honey and vanilla extract. Pulse 1-2 minutes. Add in the flour mixture and pulse until mixture is combined. A thick batter should form. Scoop into an 8-mold granola bar pan sprayed with cooking spray, or 12 muffins. Baked for 26-28 minutes, until toothpick inserted comes out clean. Make frosting by whipping Greek yogurt with the nut butter. Place in a zip lock fastened bag and cut a small hole in the corner. Frost each in a zigzag pattern. Store in the refrigerator for 1 week, or freeze without frosting for up to two months.